I was sure we had found a shipwreck with a pile of gold coins fully visible, or at the very least a very large shark. The cheers coming from the control room were just so loud. 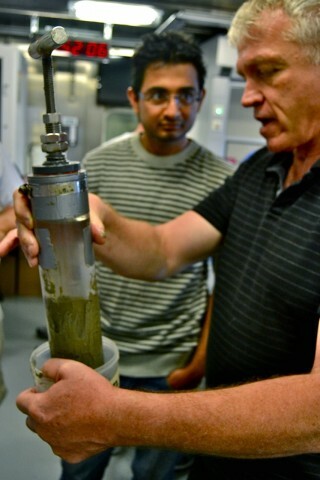 I was sitting in the room next door and though there was an ROV monitor in front of me, I had been distracted. Calling over to learn what wonder I had missed, I must say I was a bit surprised by the response. The dive had begun this morning on time. There were a few glitches, like a brief problem with one of the ROV’s thrusters, but all told the 7 hours or so on the bottom went smoothly. 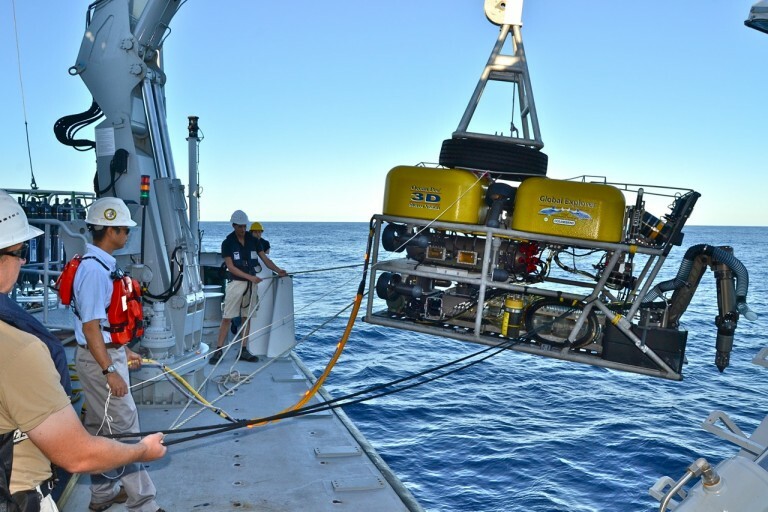 The ROV team guided explorer up two different sides of Aransas Bank where, as far as we can tell, no one has ever dived with an ROV or a submersible. The fish may have been even more plentiful here than on our dive two days ago at Baker. 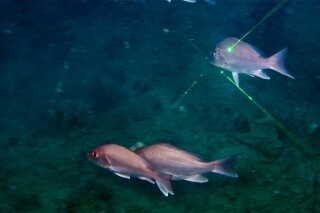 We saw loads of red snapper on screen, and others showing up in schools above on the ROV radar. It was mostly red snapper, the main draw for fishermen who make the trek 50 or so miles out here to fish. And we got to see our first shark of the trip. There were actually three different shark passes near the ROV but they may have all been by a single silky shark in the six-foot range that found the bright lights worth investigating. The less mobile bank dwellers also surprised us. 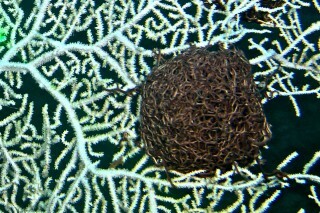 Here at Aransas the team spotted several basket stars, though there were none we could find at Baker. Although you typically see baskets wadded up, when spread out in full glory the members of this unique group of sea stars are spectacular. They look something like a normal sea star with webbing between their arms that’s as exquisite as a doily your grandmother might knit. And there were other sea star species we hadn’t yet seen. What we didn’t see was also of note. For instance, we couldn’t find a single sea cucumber, though they were fairly common over at Baker. Why the differences? Really, we haven’t the foggiest idea. In the absence of obvious explanations, figuring out the potentially subtle ecological or oceanographic patterns that dictate who lives where on the seafloor takes a lot of work, and this is just a first pass. But those early yelps weren’t any of these surprising finds. The source of excitement had been a sponge. A very beautiful, bright pink sponge in a world where beiges and tans dominate. Mind you, I like a pretty sponge as much as the next guy, possibly even more than the next guy. But the answer was not what I expected. It’s possible that when confined on even the nicest of ships for days on end folks become a mite inclined toward exuberance over anything out of the ordinary. 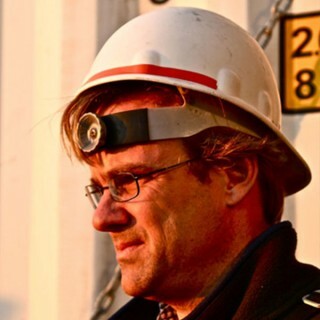 That said, it really is a rare privilege to see a place no one else has seen, and there are precious few opportunities left on the planet to do that, save for the seafloor. So, getting to see stars, fishes–and yes, pink sponges–here is a privilege worthy of some excitement. Shark encounter recorded by the Deep Sea Sysems International Global Explorer MK3 ROV operated from the Schmidt Ocean Institute research vessel Falkor off the coast of Corpus Christi on September 21, 2012. Video credit: Nathan Cunningham, marine technician aboard R/V Falkor.